Gerta does much to eradicate mosquitoes and other pests from my garden. She and the rest of her clan are non-venomous and harmless to humans. Her biggest enemies are humans, hawks, cats and dogs. I can tell you that Lily the Beagle goes berserk when she encounters any garter snake, for here is a prey she can grab and shake to death, like one of her toys. Consequently, I keep Lily close at hand when Gerta is in view. I found Gerta in one of my fountains this morning, swimming with the grace of Esther Williams amongst a chorus of tadpoles. The tadpoles do not fear her, and neither do I. But if you want to rid a garden snake from your property, here’s how you do it. Slip a rake-handle under the reptile, and gently lower it into a deep bucket. Then take the bucket to a local forest, and let the poor creature loose. Snakes do not have easy lives, and really, we ought not to harm them. Why are snakes more obvious on warm autumn days? It’s because they are about to go into hibernation. They are merely trying to soak up a little sun — just as we do — before making their long winter retreat. Are you among the snake-squeamish? Let me know in the comments field below. And don’t forget to click the Facebook “Like” button if you found this post of interest. Last of the "Love Apples"
Why Do You Plant Bulbs? Gerta is very cute. Of course I can say that because I've yet to encounter any snake in my garden! Oh, We have such a snake “issue” (I call it a problem) at our house. They love to live in all rock walls my hubby put around the property. They scare the hell out of me when I'm weeding and instead of a weed I grab Gerta's cousin. So instead of killing them… I just stopped weeding. Hmmm guess it's not really a problem! Brenda – do you have cats on your property? They might be killing the snakes. Erin – I have stone walls here, too, and yes, they are snake-magnets. That's because of the warmth the stones afford. Your weeding issue made me laugh out loud! 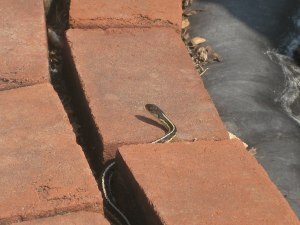 Kevin, I found a garter snake today on my shed's concrete patio. I was lifting some leaf bags and trying to tidy up and a snake slithered out toward me. It was about 14 inches long and I screamed bloody murder. I screamed and screamed and nobody came to save me. I hate snakes. You say they are good for the garden. My other friend just told me they are some kind of a “blessing” but I don't like them. I won't hurt it but I won't clean my shed patio either. The snake wasn't sunning itself, and I fear it was laying eggs or making a nest. It was in a dark spot. I didn't know it was a garter snake until I looked it up on the internet. Is a ribbon snake the same as a garter? Mine looked just like Gerta. Oh no, I called it “mine.” I don't want it to be mine! I want it to be yours! I would sooner stick a rake in my eye as pick up a snake with a rake. Not happening. I would freak, scream, and probably keel over from a heart attack! I don't mind snakes…but I think their food makes better pets. (I have pet rats and love mice.) I think Gerta has a very pretty face and wouldn't mind a snake in my garden, but while snakes are find worms creep me out. My mom wonders what kind of gardener I am when worms give me heebee jeebees, but, there you go! Brigid – I just spit coffee through my nose! George was probably hiding — momentarily — from a predator. It certainly wasn't making a nest — garters don't lay eggs, but give birth to live young in August-September. In winter they seek places which do not freeze, typically deep below a pile of rocks or logs. Anyway, if you screamed a lot, your snake has probably already left. Believe me, they can hear!!! Anonymous – welcome to A Garden for the House! Katreader – Worms?! Your mother is right…that IS an unusual phobia for a gardener! Kevin, do you mean to tell me that the garter snake deliver babies and don't have eggs? Bats also deliver babies, and one at a time, like one per pregnancy. I can't handle it. This makes me hate them more for some reason. Sorry you spit your coffee through your nose. Hahaha. Oh no, but wait. You said they deliver babies in August or Sept. It's only Oct and I bet there are baby snakes around. I have a small pond with froggies in it. Is this attracting them or are they just attracted to me for the same reason other snakes are? Brigid, I don't know why other snakes might be attracted to you (! )…but the garter is merely looking for insects. He (or she) does like water, and the mosquitos that fly around it. If you have stones around your pond, you probably have a few snakes that hide beneath them. I'm sure this is a comfort to you. Brigid, my mother is also terrified of snakes.So……..we live in Ireland, there are no snakes! St Patrick banished them all into the sea. Her neighbour had two pet corn snakes – they escaped, she moved house! You have an Irish sounding name, perhaps St Patrick would do the same for your garden???????????? Hi Mary Frances, I've heard that St. Patrick drove the snakes out of Ireland. Is it true? You know, that fact combined with the weather in the 50s could get me to move there. My grandmother's house is still in the family in Donoughmore, Cork. But wait, what about the corn snakes? Kevin, I have a lot of stones around the pond and I normally move them around and fuss with them even though they are heavy. I will never touch them again EVER. I die a little even when I open this page and see that photo of the snake head. I'll take spiders any day. The only thing that makes me scream as loud as a snake is a bat………but to be honest, I hate snakes more. Ohhh I am so glad Gerta lives in your garden and not mine. I am most certainly NOT fond of snakes, and I have (too) many in my garden. BUT!! I have 'good' snakes in my garden. California King, garter, and several other smaller, less identified ones. The ONLY reason I say good is that I live in rattlesnake territory, and I believe that the CA kings keep the rattlers away. If it comes to a choice, I'll take the CA king everytime over a rattler!! I still avoid them and don't like them, but don't try to get rid of them! Kevin, My friend Pam who lives near Cape Cod, told me that she admires snakes because they are deaf and nearly blind, have no arms and legs, yet manage to scare everyone. I told her you said they can hear and have ears. Now who is right!? By the way, I made my daughter put the hose away on the shed patio and she said George is not there. I think he is there or near the pond. I'll never lift another stone. Some handyman is going to make a good living on me. I think snakes are beautiful creatures, but they can appear so quickly and quietly out of no where that it is very unnerving! I know they are as frightened of us as we are them, but still, I am glad I have frogs and praying mantises in my garden to conquer pests instead of snakes! sksweeps – Rattlers…yikes! Guess its best to make friends with the California kings! Brigid – Garters do have ears — they are under the skin. Renee – Welcome to A Garden for the House. I'm lucky to have frogs, toads and praying mantises here, too. Anne, When you say “upstate,” do you mean upstate NY like where Kevin and I live? I didn't know we had rattlesnakes here. I'm choking back sobs. Brigid, I know you will never go to http://www.pet-snake.com, where there is an excellent description of a snakes ” hearing”. In short, they feel vibration through their lower jaw muscles and bones, which goes to a bone. The auditory neurons create a topographical map which allows the snake to pinpoint prey. Tree snakes can see the best, burrowing snakes the worst, but can track movements. When you take off as though you were shot out of a cannon, they know you are moving away. No ears, arms, legs, iffy eyesight, so why are they the most feared animals? I say they've had legendary press. They have been associated with healing for thousands of years. i.e., the Staff of Aesclepius. The ancient Irish pagan goddess Corchen was an earth goddess. A visit from the earth goddess should be considered good luck for gardeners. Anne – Wow! Putting myself in your shoes, I'd have a snake phobia, too. Pam – First, welcome to A Garden for the House; next, thanks for the great lesson on how, exactly, snakes can “hear.” Hope to see you here again. Brigid – Maybe a few small statues of St. Patrick strategically placed around your yard would be helpful? Just a thought, inspired by Mary-Frances's earlier comment! 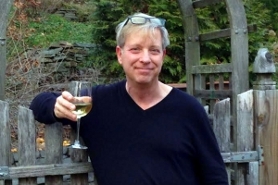 Kevin–I think Gerta is beautiful. 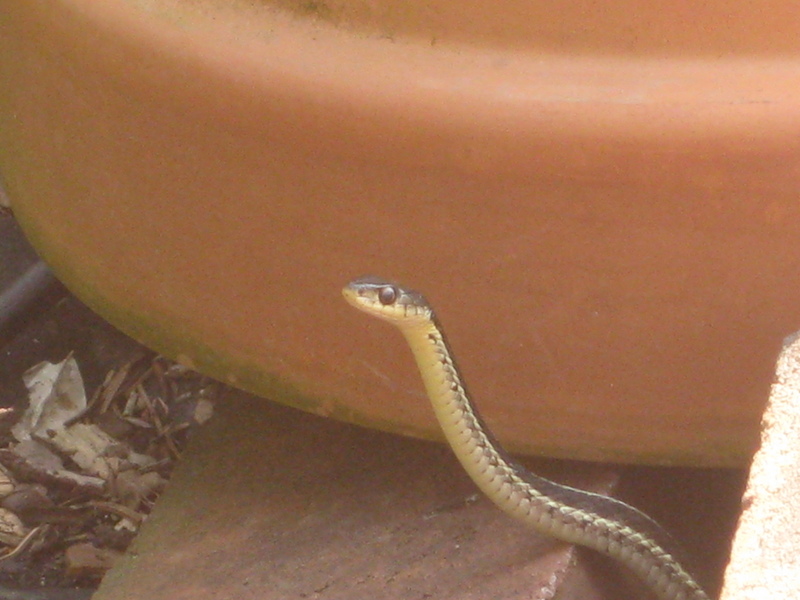 We had a garter snake for a few years that roamed our potted tomatoes, keeping them bug-free (he'd wrap himself around the stalks and branches and wait for prey). Talk about effective organic gardening! He disappeared 5 years ago–Wish he'd come back. I'm not troubled by Gerta. We try to co-exist with whatever finds its way into our quite small (but Urban Habitat-Rated Garden) The colony of bats which like the space between my roof joists and the structure of an attic wall much more than the bat house we gave them for Christmas one year don't bother me either. 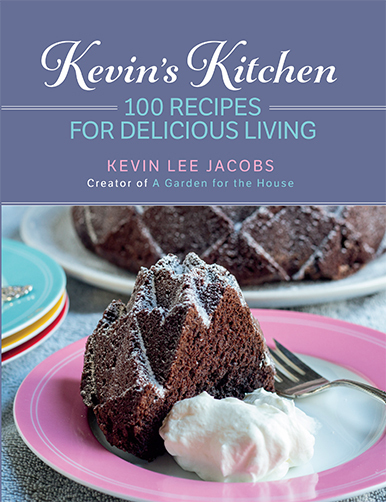 Kelly & Ted – Effective organic gardening, indeed! Build a stone wall somewhere on your property, and believe me, you'll start seeing more garter snakes. The wall provides both shelter and warmth. Nancy Shelly – I'm with you on bats. They nest here, too, probably between roof and wall. I enjoy watching them swoop and dart on summer evenings. She is adorable! My brother recently found a King Snake in his garden and we have a large black racer we allow to run rampant. Of course, where we live, we also have rattlesnakes and water moccasins, too, but they tend to leave us alone, and we let them do their thing. I’m hoping, in the spring, we’ll see some native Glass Snakes, too, because they, like Gerta, are advantageous and harmless. Do not blame the baby snakes for your subsequent fear of snakes—-it was your Mother’s screams that implanted that lifelong scar into your psyche. If you do live in the upstate area of NY, or anywhere in eastern USA, they were probably Not rattlesnakes. We have a large variety of colours and patterns of snakes here on Vancouver Island,some of which seem to have diamond patterns resembling rattlesnakes. My son and a friend, when 7-8 yrs old, would gather whole gallon ice cream buckets full from the empty field next door. James arrived at the door, seeking son John and reached into the pail and hauled out a ball of snakes–about 6 inches diameter, to show me. Mothers of Boys cannot afford to be sensitive about odd pets. I love the little snakes, they eat the nasty black slugs that got imported into our area on potted plants brought in from off Island. I also love the little and larger brown bats that are native here. I loaded a large clump of iris rhizomes that desperately needed separating and were still holding onto a bunch of dirt into a clear plastic garbage bag. I carried this bad on my forearms, loaded it into my truck and drove to work. At work I unloaded the bad, carried on my forearms to a co-workers office, sat it on the floor and opened the bag top so the plants could breath. After sitting in her office all day, the bag was loaded into her husbands car on the back seat. On his drive home he heard a rustling. Glancing at the bag, he saw that there was a snake in it. He didn’t get a good look at it, but said that it was small and brownish. Once home, he quickly threw the bag out of his car and onto the porch. The bag sat there open for several days before he or his wife dared to empty it out. The snake seemed to have left by then. I would have felt bad, but strange things always happen to that friend. Also, I’m the one who was up closest to the snake; I just didn’t see it. Mainly, I’m glad it didn’t get loose in the office, and no one got hurt, including the snake. Hello Kevin, enjoy reading your articles and all these comments. A friend of mine sent me a link to your African Violet article and I’ve wandered around in your website and have read a bunch of your articles. Like yours, my garden has a resident garter snake. I don’t have a pond nor rock piles but I have piled up branches when I am out cleaning up my yard at a corner where I also have a small compost bin for my resident snake and also a few box turtles I have found wander around in my garden. Last year, I even found a baby turtle while weeding. I have not any idea how these turtles found my garden. Like Katreader, I don’t mind snake but I do not like worms (nor caterpillars) at all. During summertime, if I am out working in my garden and if my husband hears my loud yeps, screams, he would guess either I just happen to grab a caterpillar by mistake or see worms pop up nearby. We too, have a Gerta although we haven’t named her yet. She lives in the small garden by the pool and has doubled in length since we first saw her. She loves to linger between the honeysuckle vine, sago palm and the banana plant in the pool area. 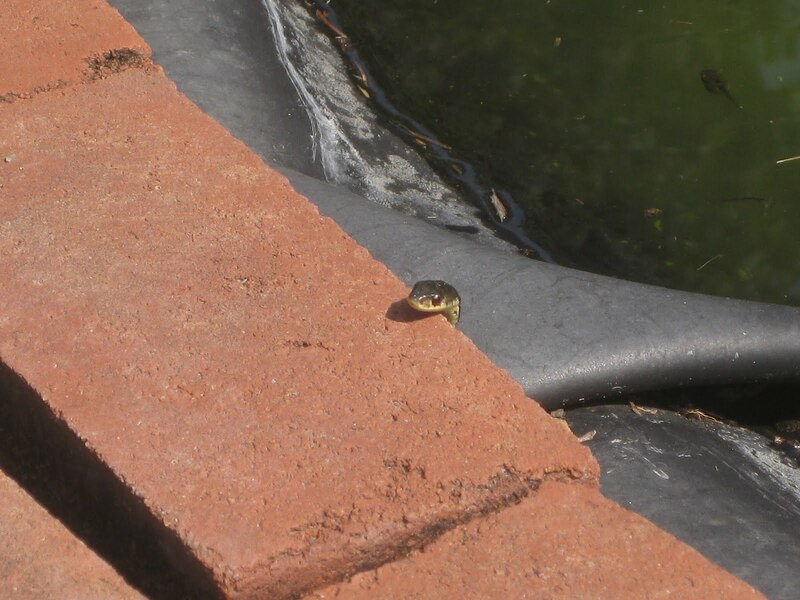 Recently I saw 2 baby snakes that I initially thought were lizards until I took a better look. We also have cotton tail rabbits, frogs, 3 types of lizards, butterflies, robins, cardinals, wrens and sparrows, and squirrels. rather not have the menacing squirrels though.